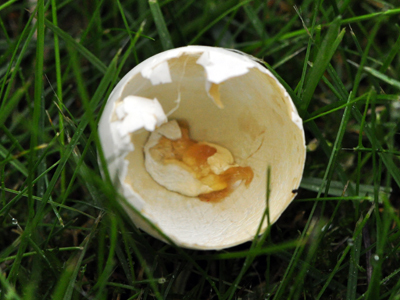 This morning I thought there was a small puff-ball fungus on the lawn, but it turned out to be this white egg shell, round-end up when I first saw it. Knowing nothing, I first guessed it was a crow’s egg, but when I looked in my Observer’s Book of British Birds’ Eggs (1954 edition) I found that crow eggs are mottled blue and brown. Then I thought it might be a tawny owl’s – we often hear tawny owls – but it wasn’t round enough. Then maybe a barn owl’s, but all these owls apparently lay eggs only early in the summer. 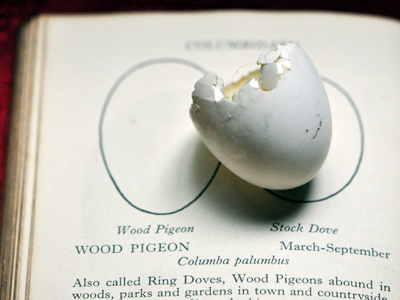 Finally I concluded it was a wood pigeon egg (Columba palumbus), as they seem to lay eggs right into September. It was the right shape, size and colour – described as “shiny white” in the book. 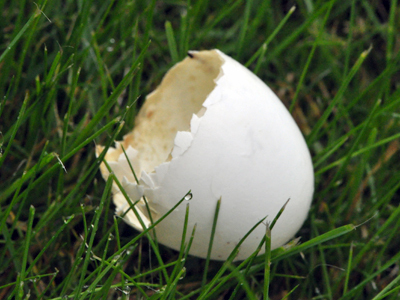 I am hoping the shell was dropped there by a parent pigeon, a long way from the nest, to put off any predators. The edge does seem neatly pecked as if a baby bird found its own way out of it, rather than a robber pecking it to bits to get at the contents. 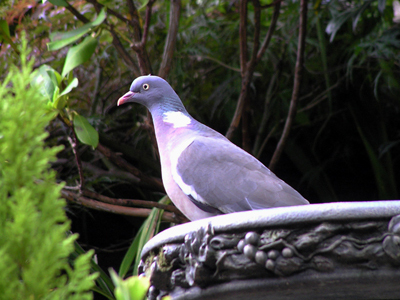 Half an hour later there was a wood pigeon on the bird bath, so they are definitely around at the moment. Do you have any stories to tell about bird eggs? As there’s yolk in the shell, that suggests the undeveloped contents have been eaten, possibly by a squirrel, who are inveterate nest robbers of both eggs and young. The fact that the broken edge is pushed inwards, rather than outwards, also suggests predation. Oh dear, Ron, thank you for your thoughts – although not happy ones! All part of nature’s rich tapestry, I suppose. Just glad wood pigeons aren’t my favourites – I tend to shout “pig” at them most of the time as they scoff everything on the bird table. Have a (comparatively) good day! We have these very tiny birds..wren type..each year they nest in a basket that sits on a table outside on the porch (right next to a rocking chair) we are constantly in the area, anyway they spend weeks building the nest . There were 6 eggs, one afternoon they hatched and soon the little birds jumped all around us and hopped over to a Live Oak tree and actually climbed up to the branches where the Mother was screaming at them..two days later we watched as they flew away..They have repeated this for the past four years, same basket and nest is revamped each time..like as if their vacation home…precious moments when they share isn’t it? As you say, precious moments! Thank you so much for sharing. We have only one wren in Britain, but I know you have many in America. Here’s our wren nesting last year (but unlike yours, it hasn’t come back). I am unable to see the pictures in this or any other post on the site – started last week and I tried two PCs (work and home) and thought maybe it wa a wordpress problem, but it is persisting. Sorry, Paul, but I have no idea! I can only think it is a browser issue. What is your web browser? Is it the same on both work and home PCs? it’s Ok now, in work anyway, on IE9 (same as home) and Chrome. I wondered if you are loading very large images and they were just too slow to load for some connections but now I can see them, i think they are optimised for web so can’t explain. Glad you are (maybe) sorted. I don’t load very big individual pictures (maximum 400px wide), although I guess some of my posts have a lot in them. Usually though that would mean you wouldn’t see some of them, not all. Ah well, watch this space, as they say. Pleased to be of help! 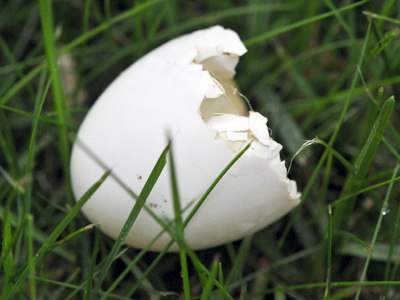 Funnily enough I saw another such eggshell on a neighbour’s garden a week ago. Thank you, and you are welcome, Pat 🙂 I will look forward to more of your blogs. A pigeon just dropped an empty shell in my garden, saw it happen. 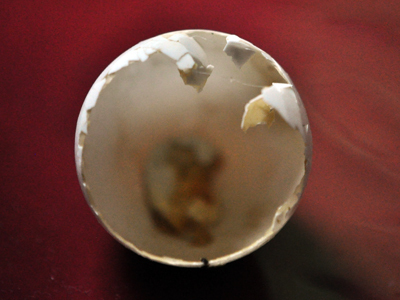 To me it means the chick finally decided to break the shell and reached the next level in its life. It has broken free from its comfort zone, only to find an amazing world full of posibilities that outreach by far the matrix it lived in. Since an egg can only be broken from the inside for the chick to live, it means it had found the force, courage, trust, patience and wisdom to transform and was ready to say farewell to its old life. This synchronistic event took place at the exact moment I decided once and for all to leave my old life behind and let the past be the past. Thank you to my friend from the animal kingdom for giving me this acknowledgment from the Universe. PS: hence the symbolism of easter eggs and the resurrection of Christ.